I quit smoking a bit over 12 years ago. I really, really LOVED smoking. I smoked a lot. Most of the time, breathing=smoking, and I breathed in about 100 cigarettes a day for many years. 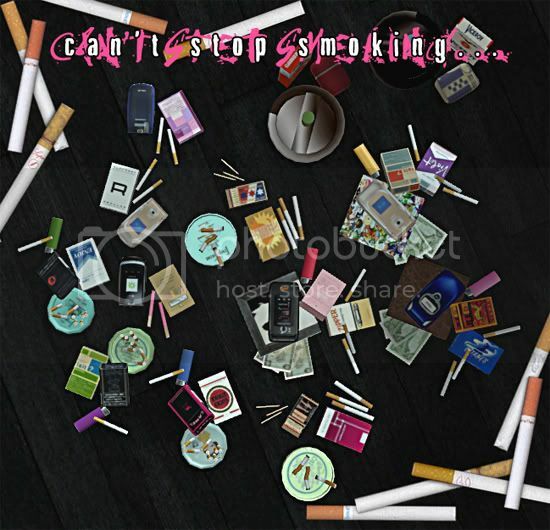 The whys and hows of quitting are a long story and not really one for a Sims download site, but I will say that I miss smoking like I’d miss one of my limbs, and I still have dreams where I smoke with varying degrees of secrecy/defiance, and wake up both guilty and wanting a cigarette. My, but I’m chatty today. If you are desperate to know where I *think* I got the black wood floor from, there is a very lame WCIF entry here. * and, oddly enough, my (former) brand of choice is not represented because I couldn’t find a good picture of what must surely still be a major brand in Canada. Huh. Probably just as well, since doing these recolors got me feeling all nostalgic about having ashes everywhere and coughing a lot. ** another recording that achieved obsessive repetition status was the Shaun Cassidy cover of David Bowie’s Rebel, Rebel, used to such an extent that friends finally asked me to please stop including it. *** because everyone realized that you were not only clever, but skilled, i.e., you’d managed to drop the needle/push the recording buttons with such perfect timing that the seque between between the ironic or ridiculous snippet and the actual song following would be perfect and seamless. This could also be interpreted, usually correctly, as a labor of love of one form or another. Posted in: downloads, flotsam, object recolors. oh, yeah! XD I just luv it! Are these smokable on sims? Um, don’t suppose you would want to share your blog code with a total stranger, would you? (Found you from Gos and thanks for the smoking accessories!) This is beautiful, but I would want to change the background pattern, and the colors, and the top picture. I love how the background pattern just sits there, that is perfect! Email if you care to chat — I am most anxious to get my grubby hands on yet another reincarnation of this design! Can you help me out please??? First these are awesome, so thank you very much for these. And the cause I’m writhing for you is that none of those download links doesn’t work. So could you please check and fix them, because I’d like to have those stuff in my game, thank you. All credit to you and the original creators, I will remove it if you need me to.